The fabric is the Sweet as Honey collection by Bonnie Christine for Art Gallery Fabrics I found at Westwood Acres and the grey background is Architextures by Carolyn Friedlander for Robert Kaufman. 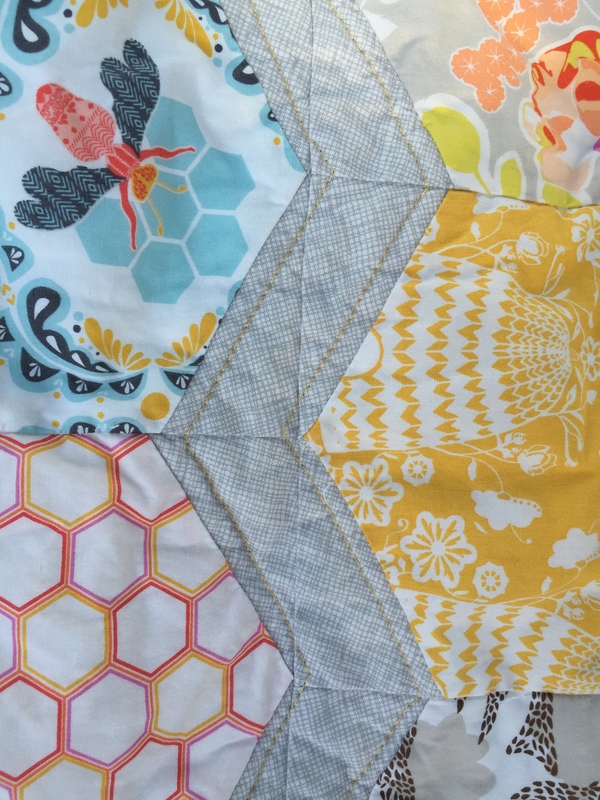 Gosh it was hard to find a coordinating fabric that would show off the bee fabric. This grey was a good find at my local LQS. 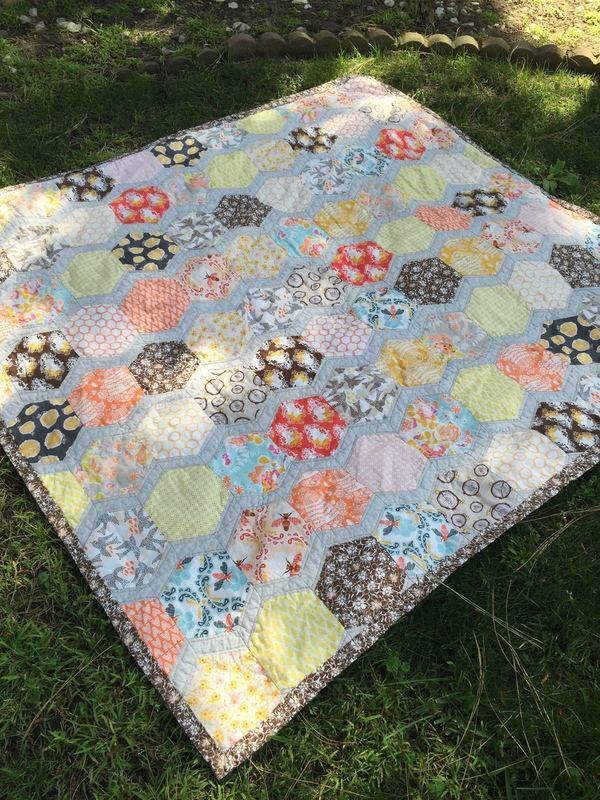 I knew I wasted a honeycomb look, but as a new quilter I wasn’t sure I could handle a hexagon quilt, so I followed this tutorial from Amanda of Westwood Acres. It was a lot of cutting, but also very fun to put together Everything didn’t quite line up, but I think you can’t tell much. But the back, the back is my favorite part. Its a hexagon!!!!! I probably would have picked a less busy background, but my sister owns two fluffy silly dogs that shed like crazy. I see the flowers as camouflage. 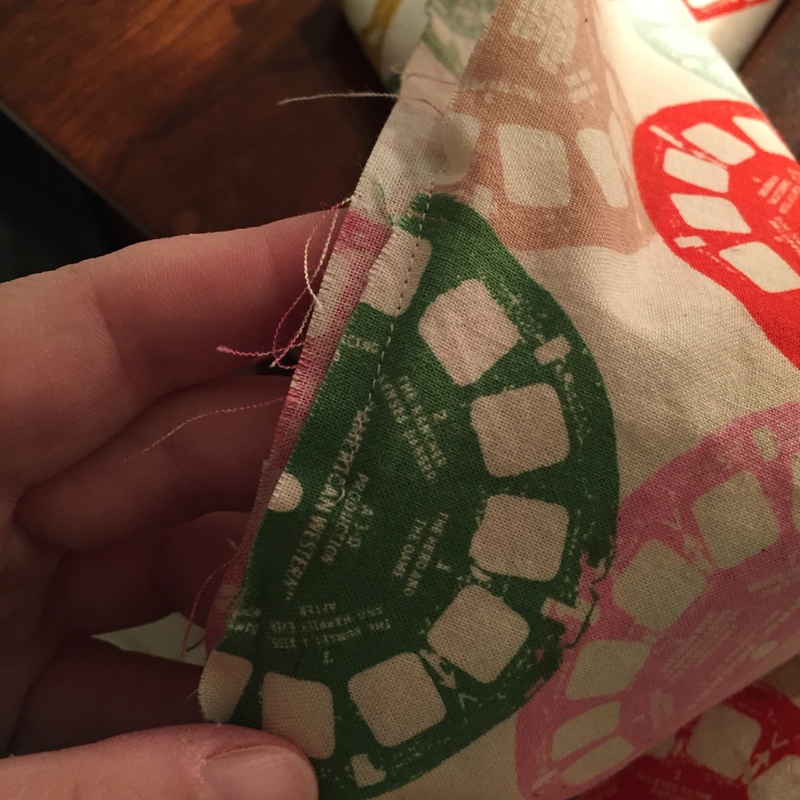 And I followed this tutorial from Cluck Cluck Sew to make the backing the binding as well. 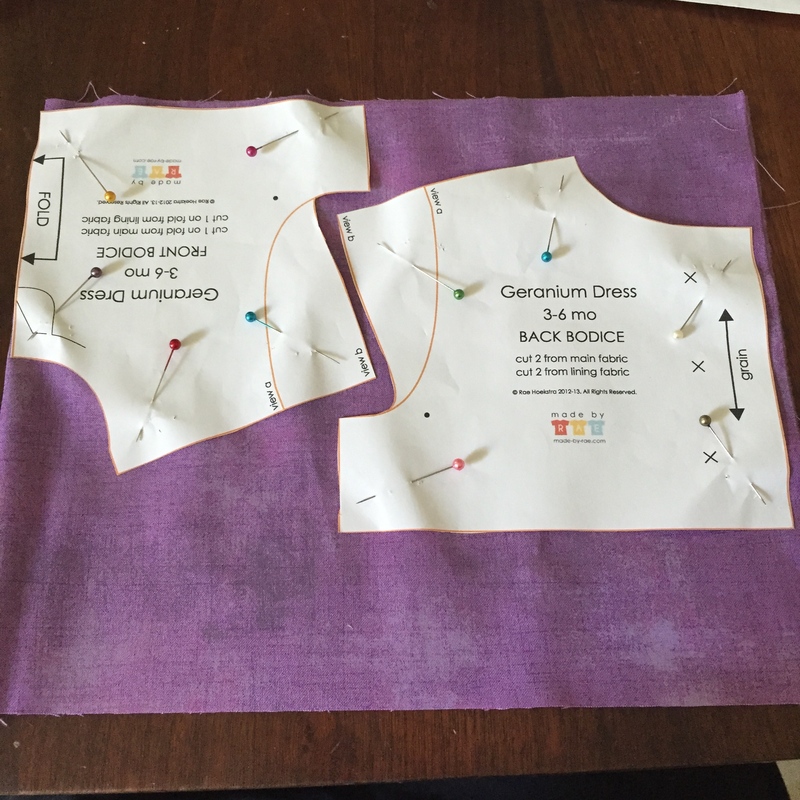 So so simple and perfect for when you don’t want a binding made from a different fabric. 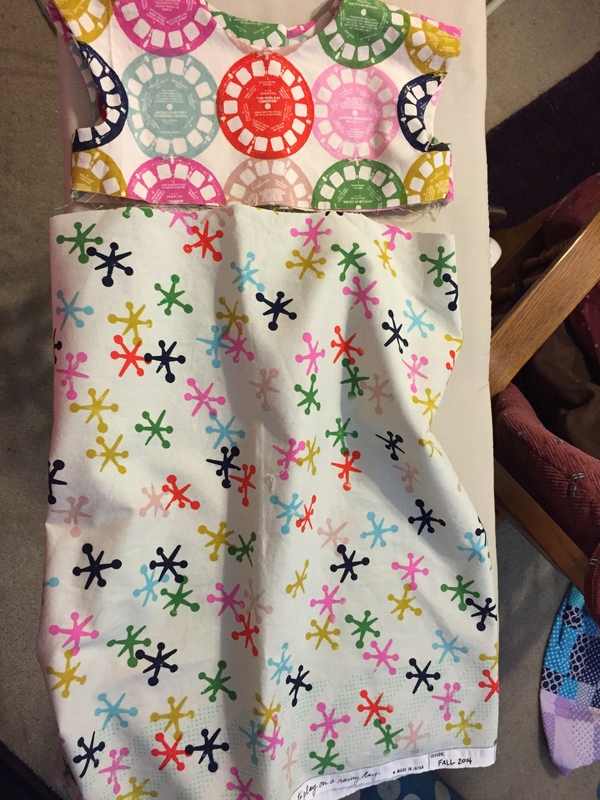 Mine was 2 inches wide instead of 1 inch, so it makes an extra wide border on the front. 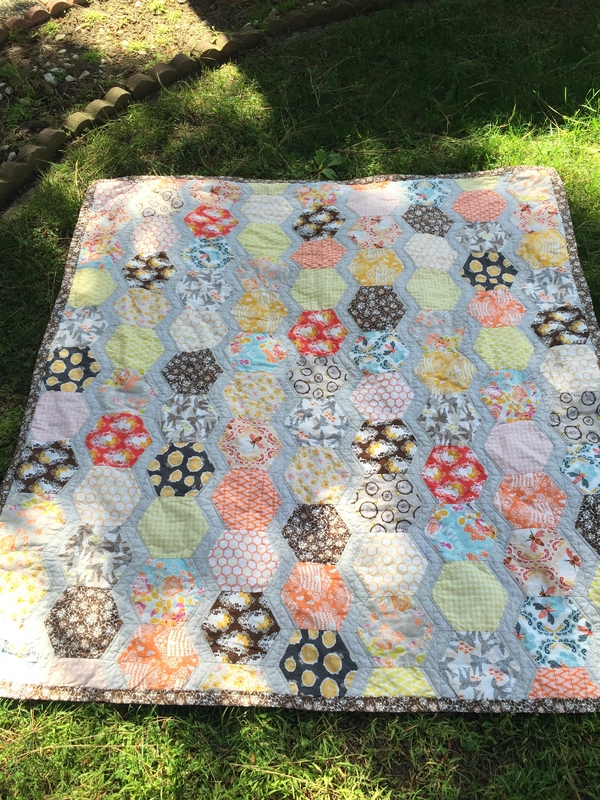 For the quilting, I like simple designs, so I followed the zigzags of the grey down the front. This was just such a fun surprise. I can’t wait to do it again! 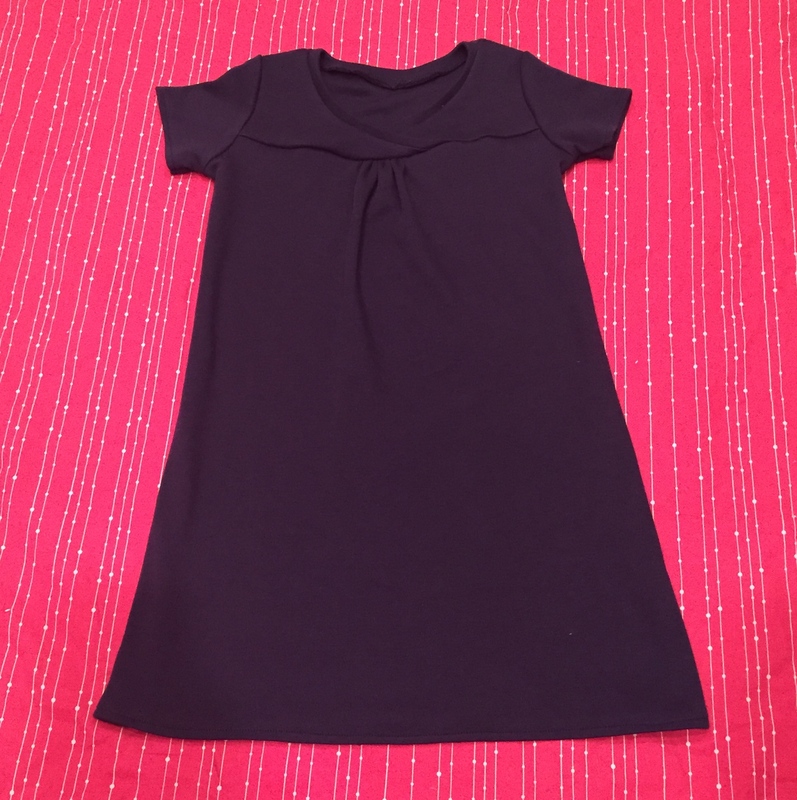 Kids Clothes Week: Day 7! Ta-da! Last day! Here on the West Coast I suppose I still have 90 minutes, but I’m calling it done. Today I managed to fit in one last project. 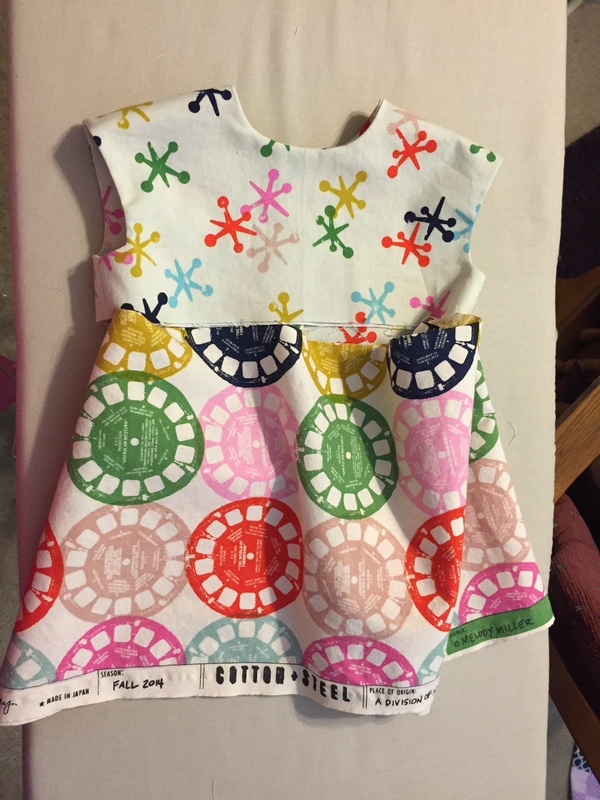 Another Geranium Dress for my younger daughter Charlie. 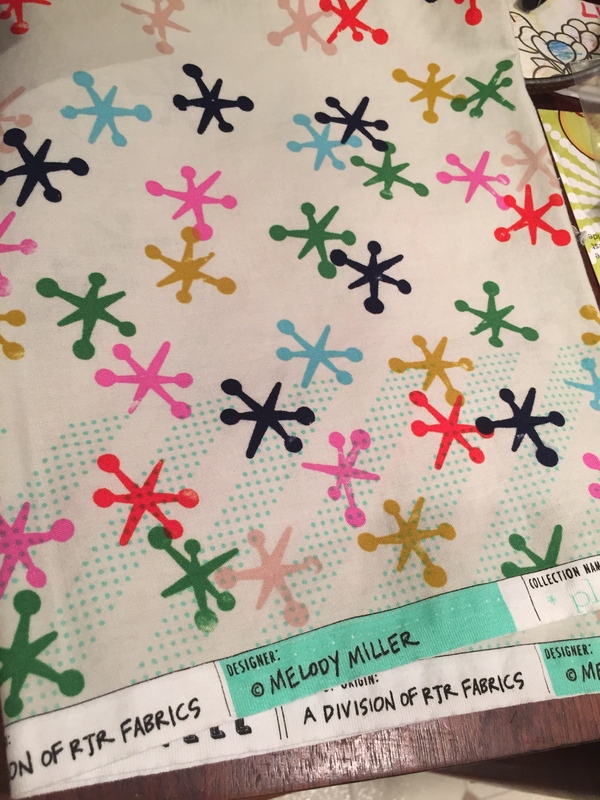 My friend Erica gave me a completely random package of fabric. It turned out to be maybe several eighth yards of the Moda Grunge collection as far as I can tell from what I could read from the selvedges. And I had lots of small pieces of fabric left over from the dress I made from Cotton + Steel double gauze. The little slip of Moda fabric was exactly as much as I needed to cut out the bodice of the dress. It was also the perfect color match. I even had buttons to finish it off and a husband who took Charlie to run errands while Lu took a nap. I almost had it totally finished by the time he returned. And I love that it is lined with double gauze. Nothing but softness for my pretty little baby. So here is the full lineup of what I completed this week. And everything even has buttons. 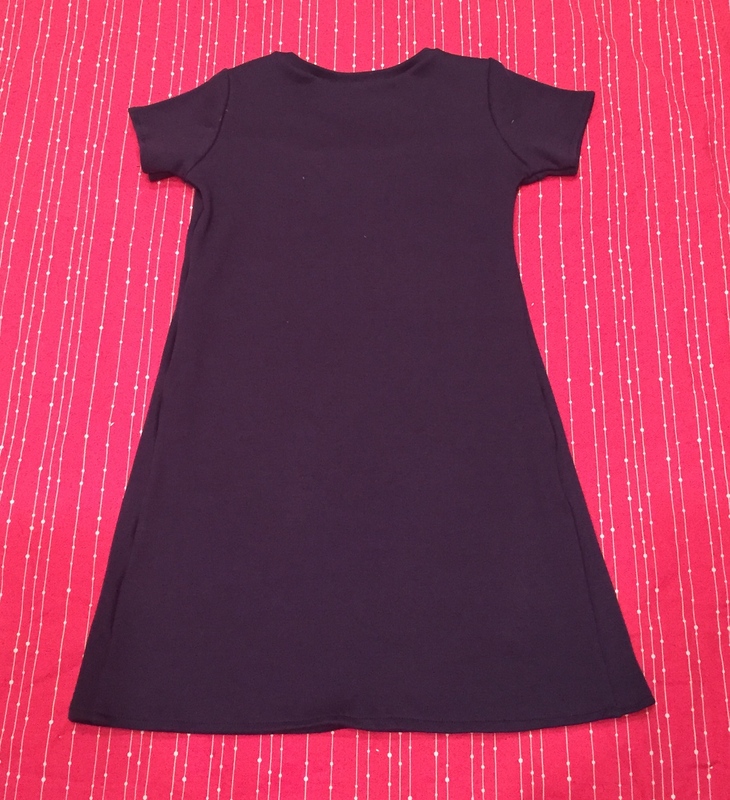 Kids Clothes Week: Day 5 and 6! 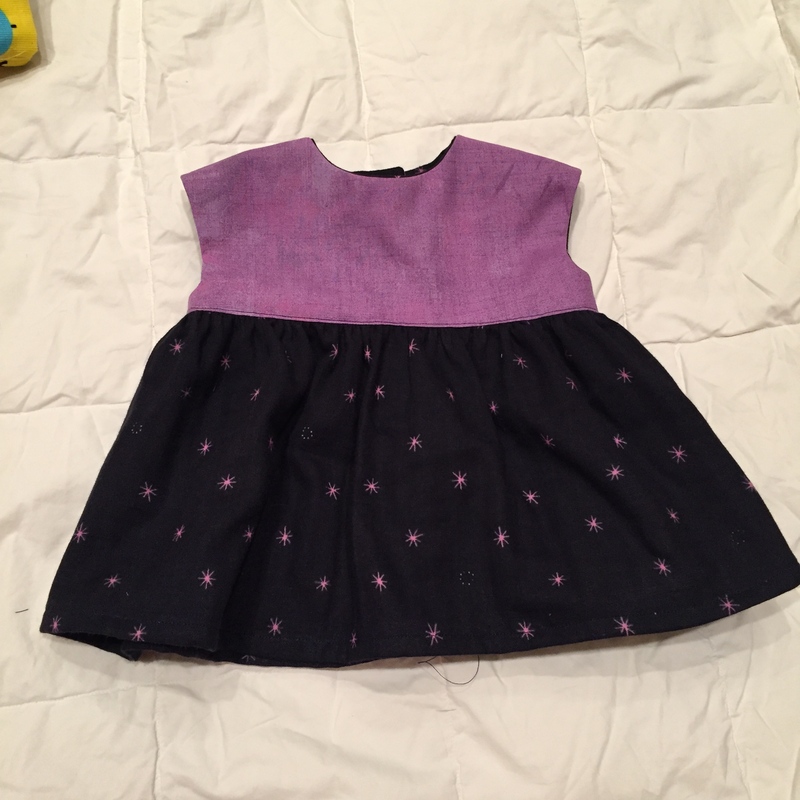 Okay so late night I was all set up to make a new school dress for my older daughter Lu. And there I am tucking her into bed and telling her I’m going to start a new dress for her when she starts talking about how she doesn’t like dresses and wants a skirt. Kids. She’s slowly becoming more interested in wearing skirts and that is difficult because I started putting her in dresses because I couldn’t find pants or skirts small enough to stay on her waist. Anyways, now she likes to wear skirts more only I have all these dress patterns ready to sew for her. Last night I didn’t sew. I knit instead. At least I was knitting for Lu so I think it still counts for Kids Clothes Week. I was able to bind off the sweater and now is only needs ends woven, buttons sewn on, and a good bath. This is Petal from Brooklyn Tweed in Anzula Nebula. The color way is Petals so I figured the combination was meant to be. Anyways today I decided that I’m the parent and I know Lu has to wear navy and red to school so I made the dress. 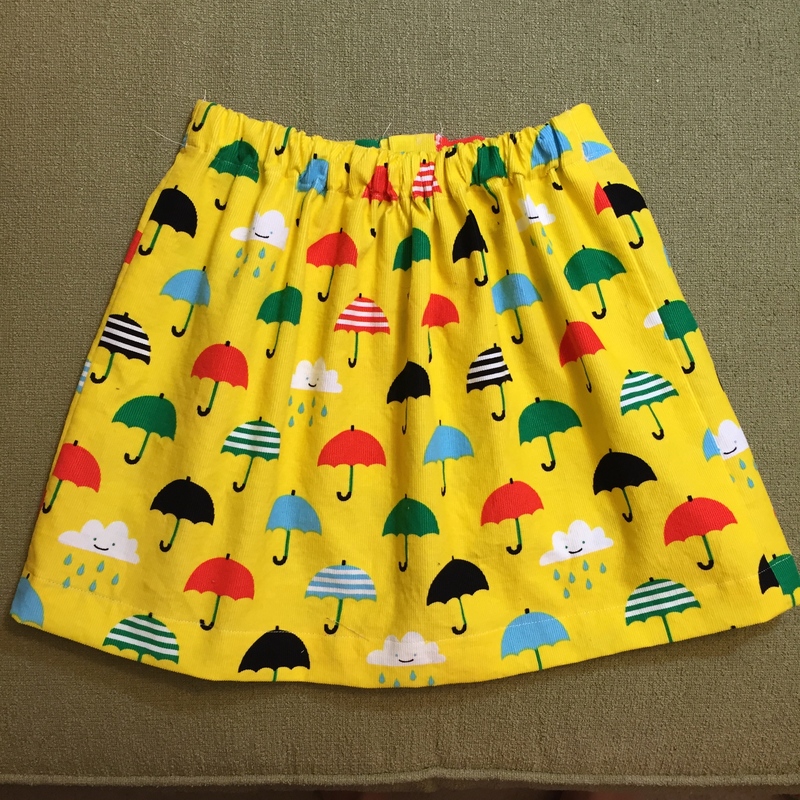 This is from the same pattern as the umbrella skirt Olive + S’s Hopscotch. It is made with some awful poly blend interlock I bought at JoAnn’s. I hate this fabric. I still have half of what I bought left over. But it will make a serviceable school dress and that’s the point. Now what do I make tomorrow for the last dat of Kids Clothes Week? 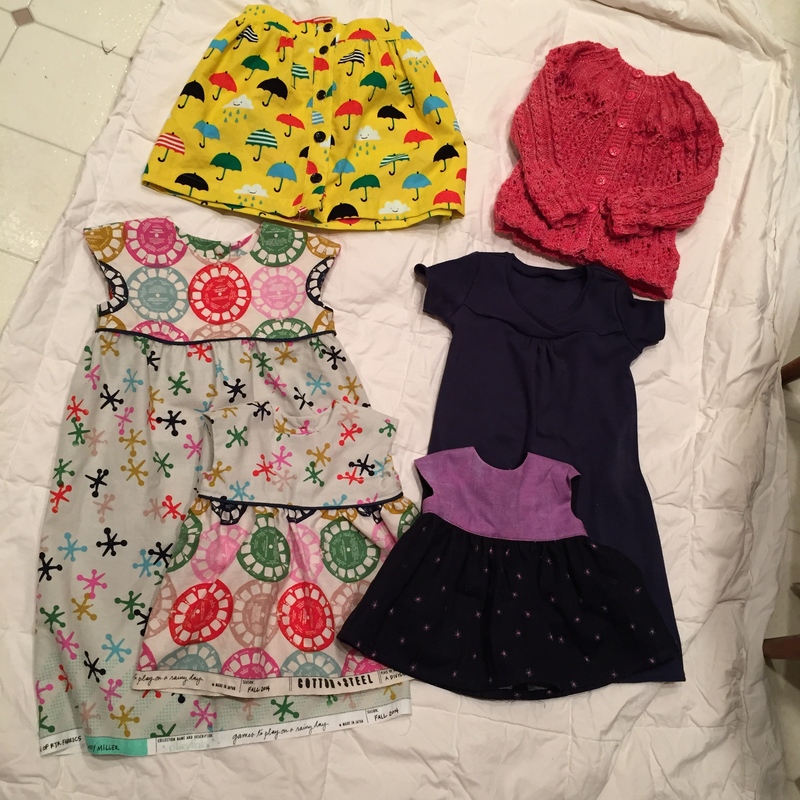 I’ve made more things for my older daughter, but she was also more in need of clothes. Should I sew the baby some love tomorrow? Kids Clothes Week: Day 4! Yeeeeeesssssssss. Look at this corduroy. Isn’t it pretty? 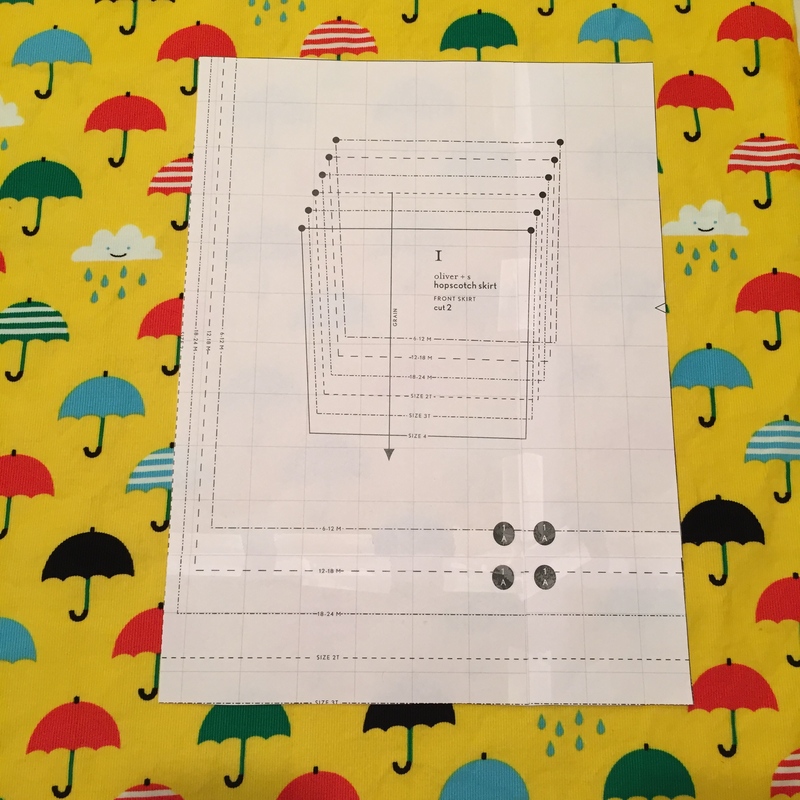 I was really really looking forward to cutting into this length of Small World fabric by Rae Hoekstra. 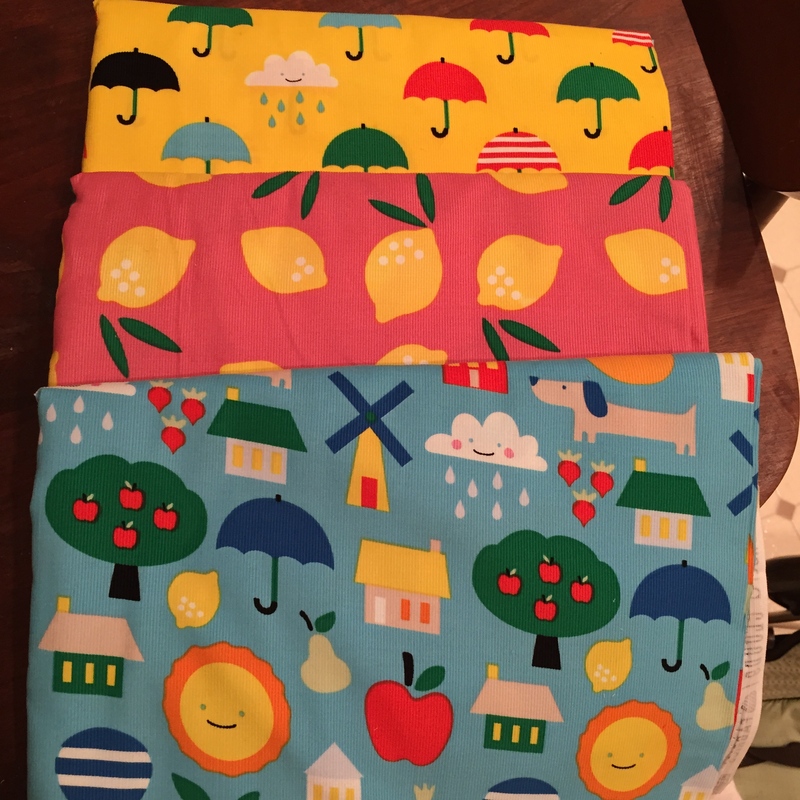 I have the Lemon Drop and Small World prints too, but these umbrellas named Signin’ in the Rain really called to me to be sewn first. Sadly it was also printed a little off gain. 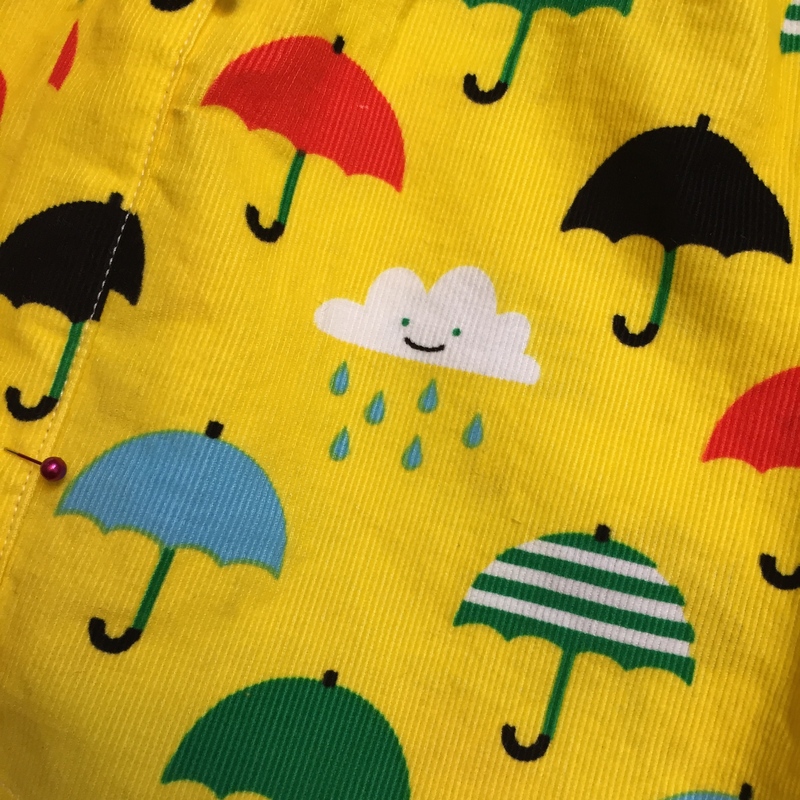 I know little rain cloud. It is sad. 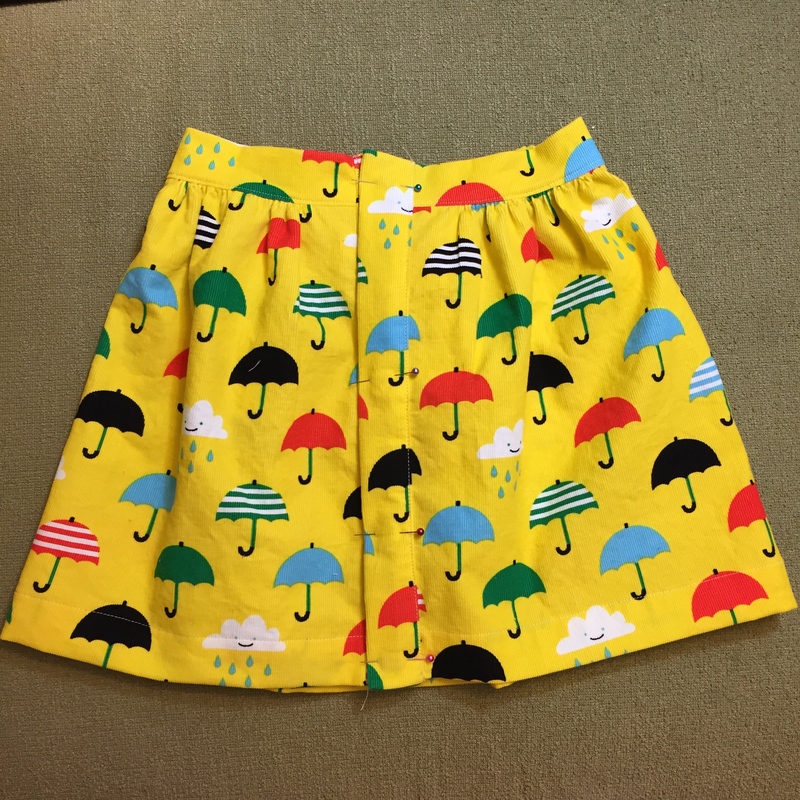 But the resulting skirt is anything but sad. 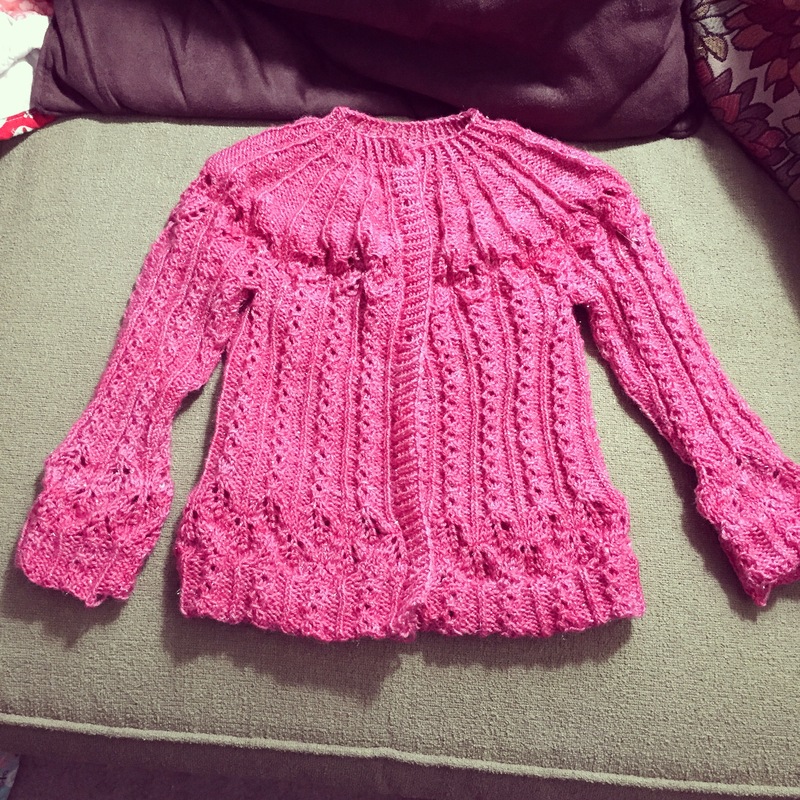 I cannot wait to buy buttons for it so I can have DD1 give it a twirl! I did a search for patterns this morning and ultimately decided on the Hopscotch Skirt from the amazing Liesl at Oliver + S. Her patterns create the most professional garments and this was no exception. It only took any hour and a half to cut it out and sew it all together sans buttons and buttonholes. I thought this would take two nights to complete so now I get to pick out a new project for tomorrow. Lucky me!!! Kids Clothes Week: Day 3! 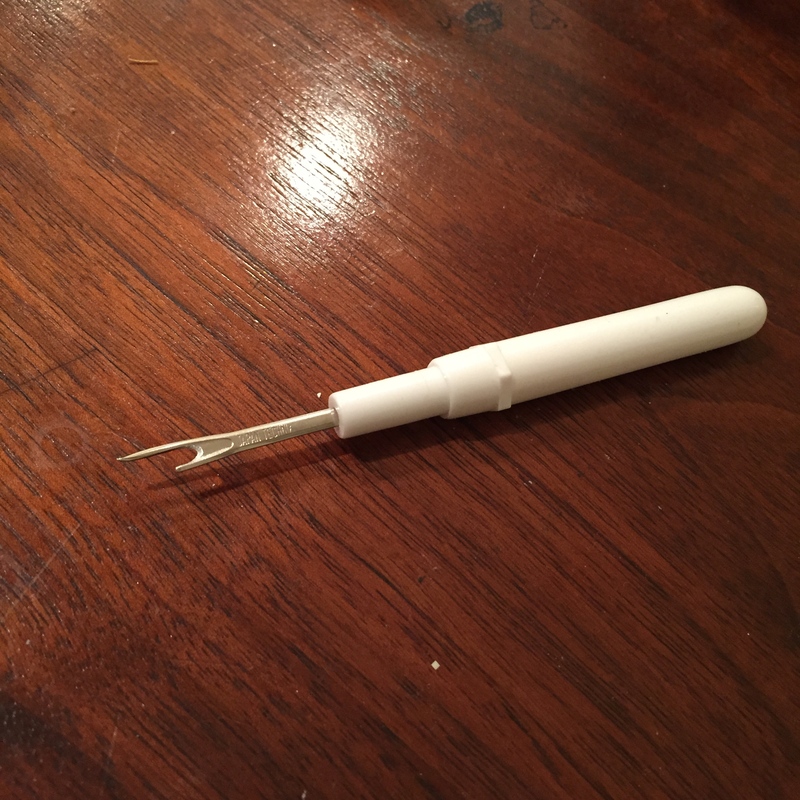 That’s right, a seam ripper. Adding the piping didn’t go very smoothly. 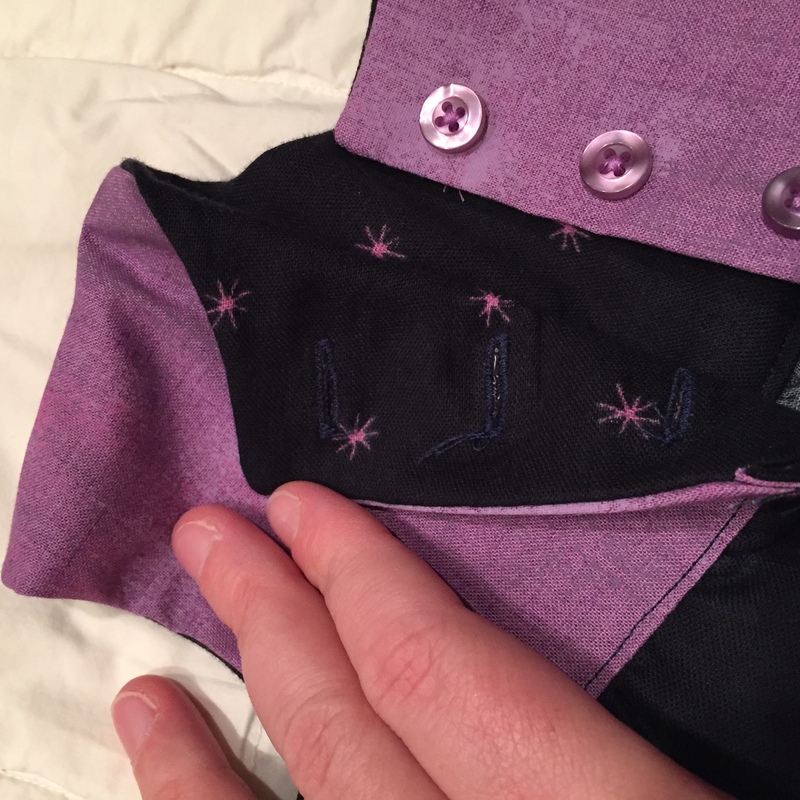 It’s been more than 10 years since I last tackled sewing in piping so I did what lots of people do…I headed to the internet for some tips. I don’t have a piping foot for my machine, so I tried using my zipper foot and then proceeded to swear and yell while ripping it out 3 times. Finally I put my regular foot back on the machine and got the piping to go in nice and smooth. Well, except for sewing the skirt into the waist multiple times in both dresses. It’s that kind of night. In the end I got both finished except buttons and buttonholes. I couldn’t find any buttons to match in my stash, so I’ll hit up a store this weekend or maybe even one of these evenings if I have a chance. I think I like them as is with the selvedge edge as the hem. What do you think? I’d love to hear some opinions since I have a few more days to finish these before the deadline! 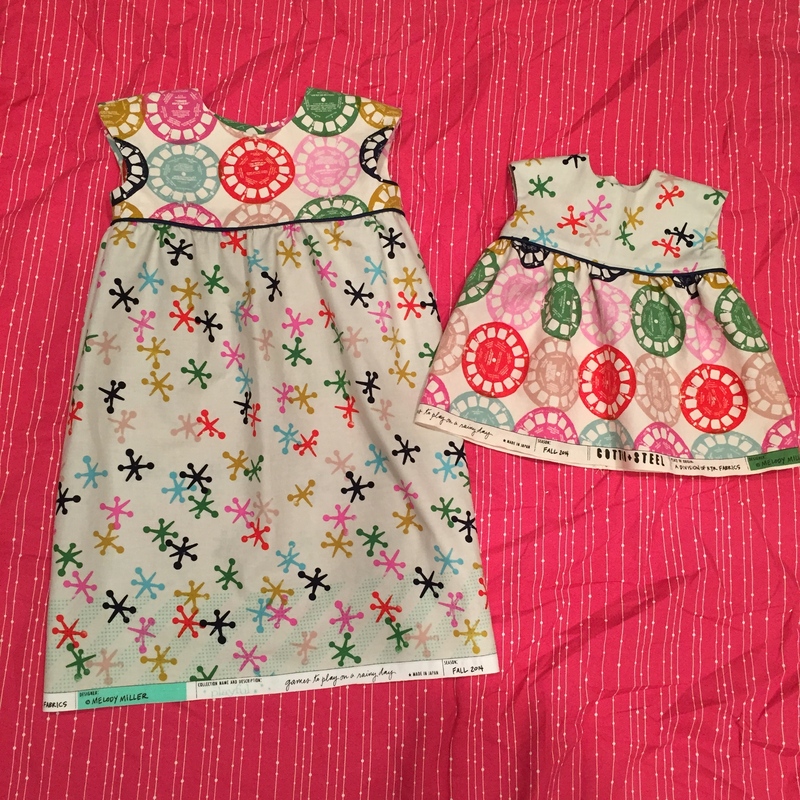 I tossed these cute fabrics in the wash tonight. 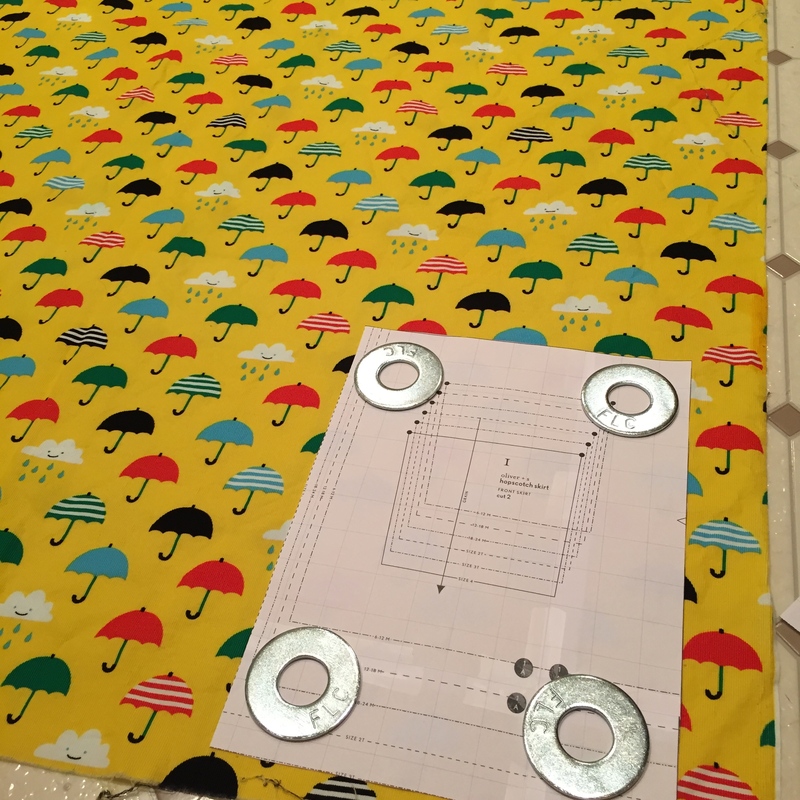 Tomorrow I think I’ll start on a skirt for DD1 in either the umbrellas or the lemons. 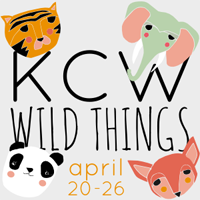 Kids Clothes Week: Day 2! Dinner time, bath time, nurse the baby, and do the dishes. A mother’s work never seems to be done, but tonight I carved out my sewing hour again. I made good progress on my girls’ outfits! Bodices are ready to be attached to the skirts. I made could have kept going tonight, but I want to add navy piping between the bodices and skirts. I need to be more rested to tackle piping! I think they are off to a good start. 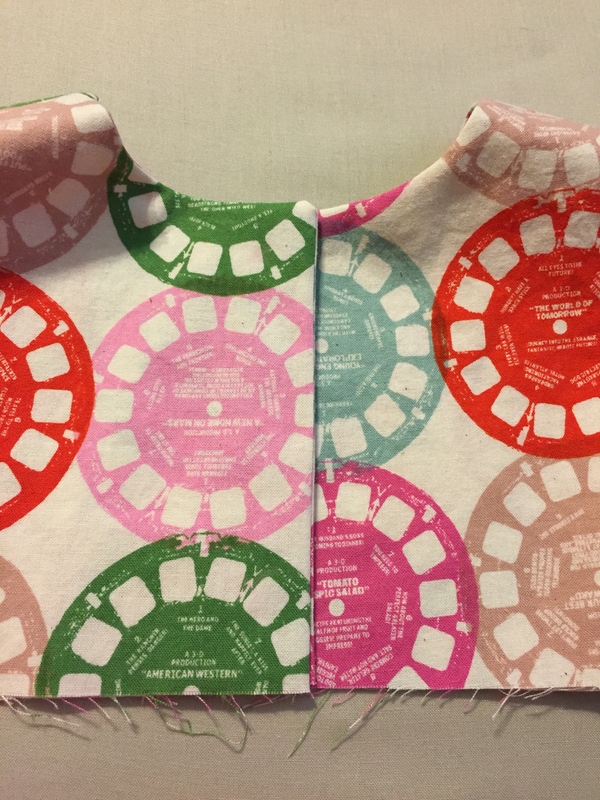 And it is nice to make clothes with just plain quilting cotton. 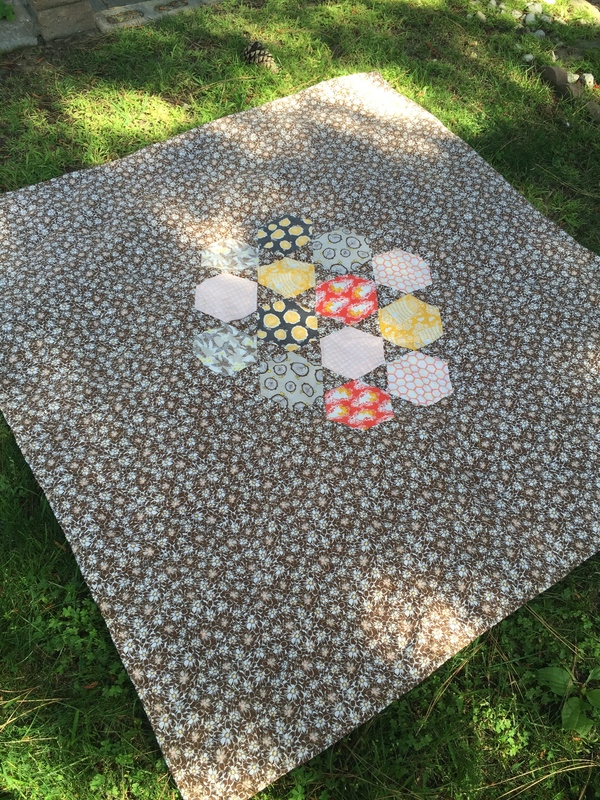 I’ve been using other types of cotton fabrics lately and quilting cotton is just so much easier to work with. I’m exceedingly pleased with the the way the backs of the skirts meet. However the back of the viewfinder bodice was not as orderly. Of well. Tomorrow I tackle piping, hemming, and buttonholes. 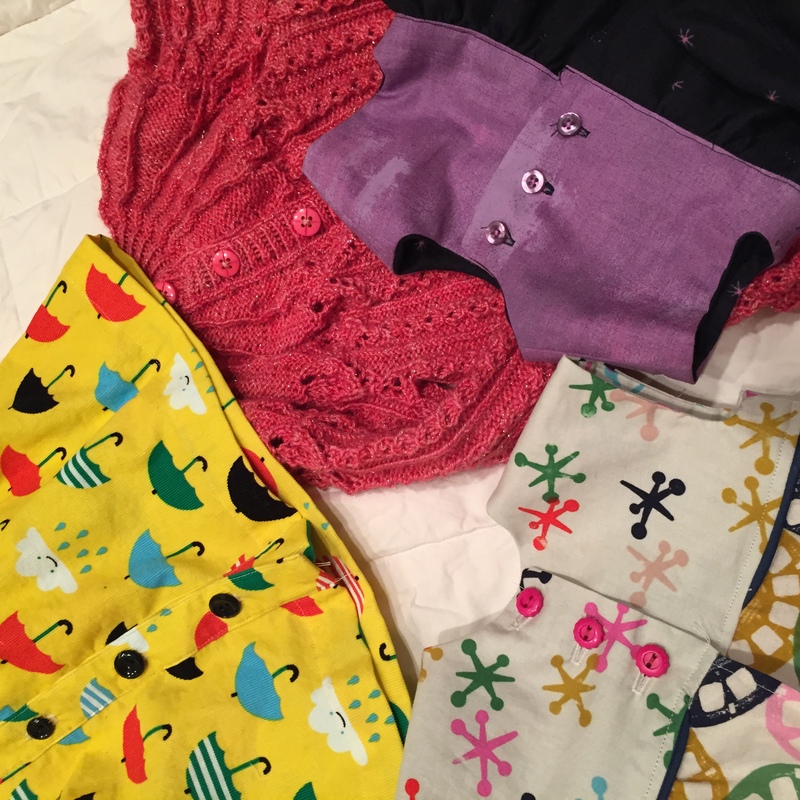 Kids Clothes Week: Day 1! And so it begins. 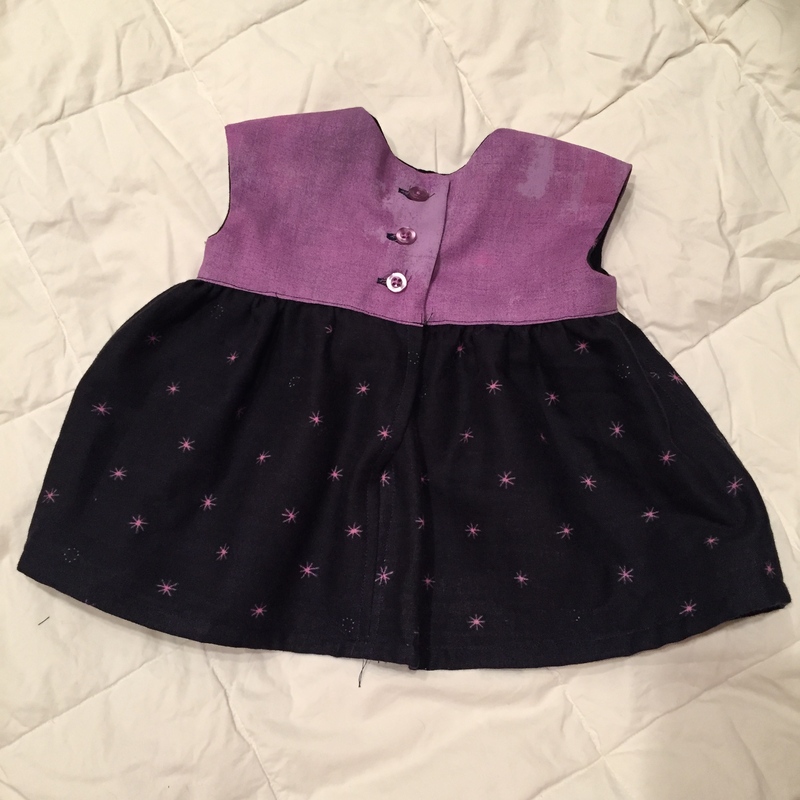 Today is day 1 of Kids Clothes Week and I am joining the challenge to take an hour a day to sew for my kids. 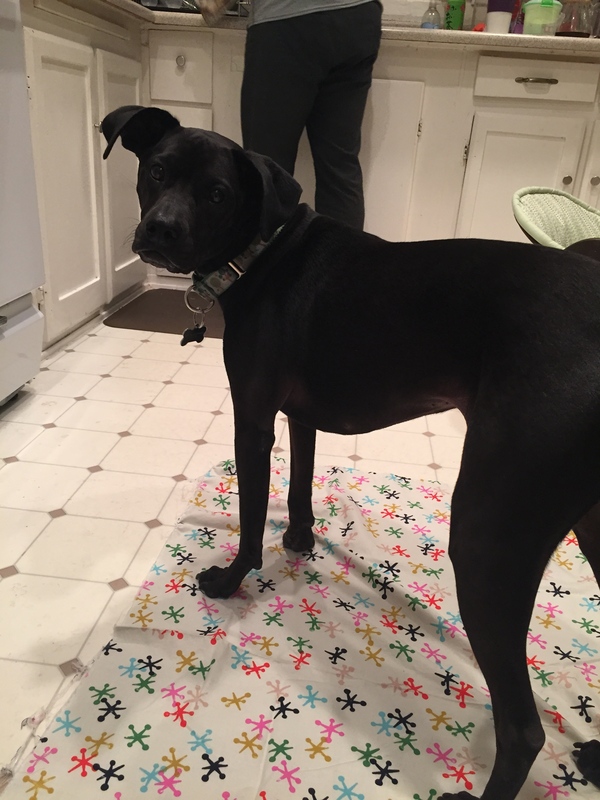 Step 1: Get your dog to get off of the fabric. 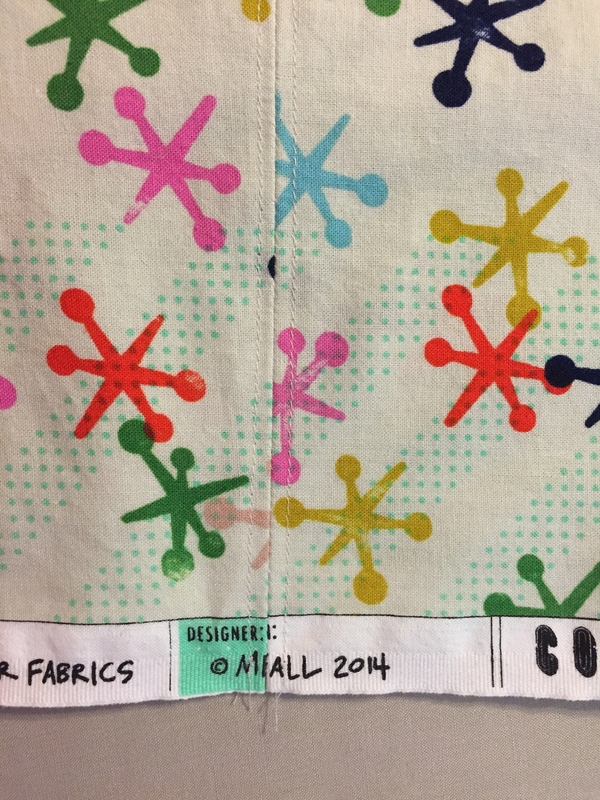 I have some good fabrics to pick from, but I only had a couple choices washed and ready to go, so I picked a couple prints from the Cotton + Steel Playful collection. 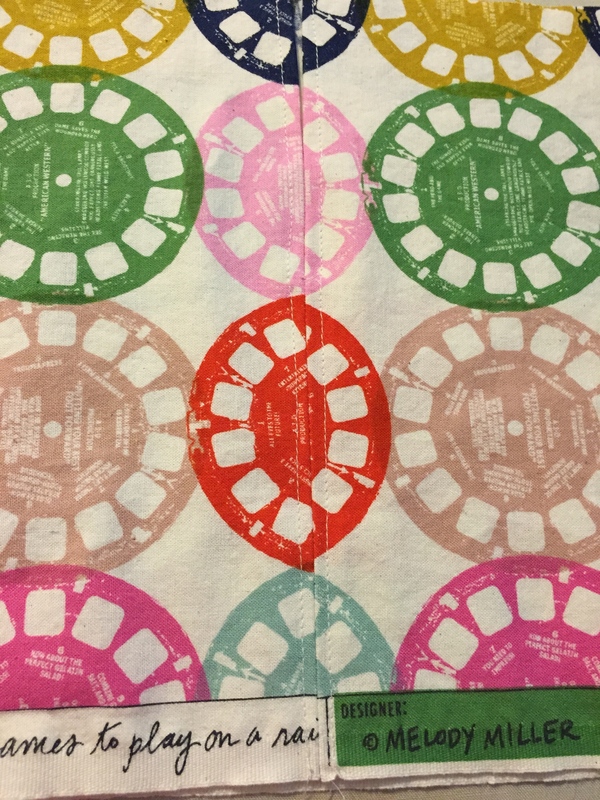 Did you know the jacks fabric has a border? I did not, but now that I do it will be at the hem of DD1’s dress. 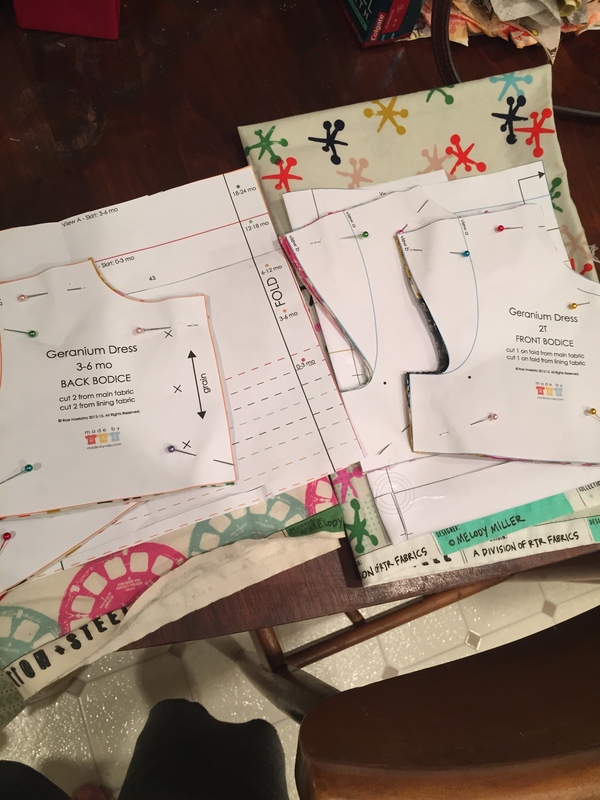 Tonight I was able to get DD1’s dress and DD2’s tunic cut out. Tomorrow I’ll start doing the sewing!